Will Georgia Kill an Innocent Man? 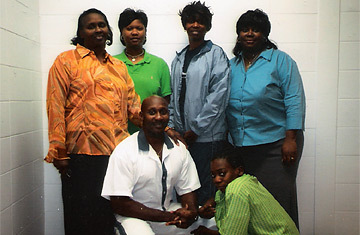 A snapshot from a family visit to Troy Davis, who is on Georgia's death row. The pending execution of Troy Anthony Davis, scheduled to take place on July 17, is raising serious questions about his guilt  and about the Newt Gingrich-era federal law that has limited his appeals options and prevented him, say his supporters, from getting a fair shake. Davis, 38, a former coach in the Savannah Police Athletic League who had signed up for the Marines, was convicted in the 1989 murder of Mark Allen MacPhail, a Savannah, Ga., police officer. MacPhail was off-duty when he was shot dead in a Savannah parking lot while responding to an assault. Davis was at the scene of the crime, and an acquaintance who was there with him accused Davis of being the shooter. Since his conviction in 1991, Davis has seen each of his state and federal appeals fail. But in the court of public opinion, Davis presents a compelling argument. Seven of the nine main witnesses whose testimony led to his conviction have since recanted. The murder weapon has never been found, and there is no physical evidence linking the crime to Davis, who has asserted his innocence throughout. Earlier this month, two of the jurors who sentenced Davis to death signed sworn affidavits saying that based on the recanted testimony, he should not be executed. "In light of this new evidence," wrote one juror, "I have genuine concerns about the fairness of Mr. Davis' death sentence." One of Davis' major obstacles has been the federal Antiterrorism and Effective Death Penalty Act (AEDPA), legislation championed by former House Speaker Newt Gingrich as part of his Contract with America and signed by former President Bill Clinton. The act was passed in 1996 as a way of reforming what Gingrich called "the current interminable, frivolous appeals process." Its major provisions reduced new trials for convicted criminals and sped up their sentences by restricting a federal court's ability to judge whether a state court had correctly interpreted the U.S. Constitution. Facing political pressure one year after the Oklahoma City bombing and seven months before the presidential election, Clinton signed the bill, but inserted a somewhat incongruous signing statement that called for the federal courts to continue their oversight role. That was wishful thinking, say many legal experts. "President Clinton was trying to have his cake and eat it, too," said George Kendall, senior counsel at Holland and Knight and a board member of the Death Penalty Information Center. The reality since 1996, legal analysts say, has been a U.S. Supreme Court that has narrowly interpreted the act, further restraining the ability of federal courts to grant new trials (on June 25, the U.S. Supreme Court refused to give Davis one last hearing). "The bottom line," said Dale Baich, an assistant federal public defender in Arizona, "is that the AEDPA is very harsh and unforgiving." So now there are serious questions whether, as Gingrich famously said, justice delayed is justice denied. The system of appeals can still stretch out over decades, but in Davis' case, many of those appeals are now being denied for procedural reasons. In his 2004 petition to the federal district court in Savannah, Davis presented recanted testimony, most of which involves witnesses who say police coercion caused them to wrongly implicate Davis. He also presented nine individuals' affidavits that suggested that the real murderer was actually the former acquaintance who first accused Davis of the crime. The federal judge rejected the petition since, under the current law, the evidence must first be presented in state court. But Tom Dunn, the executive director of the Georgia Resource Center, which helped represent Davis, says that funding trouble prevented the center from presenting the evidence in state court in the first place. Tracking down witnesses costs money, but in 1995, just as Dunn's colleagues had been preparing Davis' appeal, Congress eliminated $20 million in funding to post-conviction defender organizations like the Georgia center, which lost 70% of its budget. Six of the center's eight lawyers left, as well as three of its four investigators, and Davis' case became one of about 80 that Beth Wells, then executive director, had to handle with her co-director. "The work conducted on Mr. Davis' case was akin to triage," Wells wrote in an affidavit, "where we were simply trying to avert total disaster rather than provide any kind of active or effective representation... There were numerous witnesses that we knew should have been interviewed, but lacked the resources to do so." Georgia officials insist that Davis' failed 2004 federal court hearing is proof he has had his opportunity in court with the new evidence. "They've had a chance to challenge the conviction," said David Lock, chief assistant district attorney in Chatham County, where Savannah is located. Davis' attorney has been filing a flurry of requests for a stay of execution until a new trial can be held. Meanwhile Davis' sister, Martina Correia, has helped assemble an diverse group of advocates  from Dead Man Walking author Sister Helen Prejean to South African Archbishop Desmond Tutu to former FBI director William S. Sessions (a death penalty supporter)  to petition the Georgia Board of Pardons and Paroles to commute Davis' sentence to life in prison when it meets on July 16, the day before he's scheduled to die by lethal injection. Correia has watched her brother spend half his life in prison. This case is not only about him, she says, but it's also about a law that short-changes the convicted. "If for any reason [the last-minute appeal] doesn't go the right way, Georgia is going to be so shamed," she said. "I just don't want my brother to have to be executed to be the catalyst for change."